Ganesh Chathurthi & kozhakattais are synonymous for me... I just love both the sweet & savory versions. 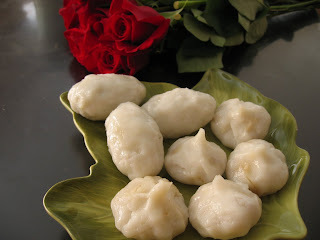 There's a lot of information out there about this festival, so I am just going to post the recipes for making these delicious dumplings. Shall post the pictures after the festival. Last year, for this festival, I was in Tokyo, Japan and we had a wonderful time with our friends at home. We organized a Ganesh Chathurthi / Farewell (to us) pot-luck (appetizers only!! - more about that in another post) party. I didn't have a wet grinder, nor did I have fresh coconut. The party was the next day and I was struggling to make the vella kozhakattais!!! Imagine my horror, when the first batch went into the cooker as modaks and came out as idlis!!! Made emergency calls to my mother and realized I was going about it all wrong (read how at the end of the post)!!! Once, that was taken care of making the rest (about 50) was a breeze!!! Needless to say, the modaks were the talk of the party - because they were delicious & of course, because of all my mis-adventures!!! Heat water in a pan, add the jaggery. When all the jaggery is dissolved, remove from stove, strain into another clean vessel. Add cardamon and heat jaggery syrup for a minute. Add grated coconut and keep stirring. Remove while it is moist. Make equal-sized balls and keep covered. Drain water completely and grind along with ginger, green chili & curry leaves to a thick and chunky consistency. Make balls / discs and steam (in idli plates) for 5 mins. Knead all the steamed balls / discs together. Press into ovals about 1-2 inches long and 1-2 cm thick, keep covered. Grind to a smooth batter (thinner than dosa batter). Add about 1.5 - 2 cups water. Heat oil in a heavy skillet, pour the batter in and start stirring. Keep stirring till the batter changes color & forms a ball. Separate into 2 halves and keep covered. Take a dish with some water and add a tsp of oil to it. Apply oil on your palms, take one half of the rice dough and knead well. Make equal-sized balls - about the size of a small lemon. Take a ball of dough and place in one palm, with the other (hand's) thumb make a hole in the center. Use your fingers to make a shape like a muffin cup. Put one sweet filling ball into this cup, and seal. Close the rice dough cup towards the center, remove any excess dough. Form a small tail - kudumi. Put in a greased (or non-stick) idly plate. Place a ball of dough in one palm, and with the fingers of the other hand make an oval shape. Put a savory filling oval into this, and seal - sidewards, to form a half-circle. Put in greased (or non-stick) idly plate. Kozhakattais are done if they look shiny. The dish with oil / water combination is essential to making these delicious dumplings. Wet your palms / fingers occasionally to make sure that the dough doesn't get sticky. Make sure that the rice dough and sweet & savory fillings are always kept covered, else they'll dry up. There will be some rice dough extra. Don't worry, no need to waste it!!! Here's what you can do with it. Garnish the left-over rice dough with mustard, crushed red chillies and finely chopped curry leaves. Make small balls and steam for 5-6 mins. You have an instant snack!!! If you are using coconut powder, frozen or dehydrated coconut, then soak coconut in hot water for 2-3 minutes, drain well and then follow recipe above to make the sweet filling. This removes the oil from the coconut, hence you get a fresher taste. The modaks are participating in Krishna Jayanthi -Ganesh Chathurthi event hosted by Purva. My daughter called to talk to me (rather to get the method of preparing kozhakattais), but could not reach me. So, she surfed the net & found ur recipe. Ur style is simple and sincere. It inspires even people without an inclination, to try out ur recipes. My good wishes to you on this festive occasion. @anonymous - Thank you, glad ur daughter found my recipe helpful! !